How to deal with a huge amount of images? With FastStone this goes fast and free of charge! I’ve been trying many workflows to find the right one for myself which would make it possible for me to sort and manage my images fast and easily. Finally, I settled on switching my cameras to the X3F + JPG mode. Right after inserting the memory card and before copying on to the hard drive I could go through the JPGs and delete the ones I didn’t like along with the corresponding X3Fs. For some photographers for whom free space on the card or in the buffer is particularly important as, for example, they often use the burst mode, RAW + JPG is not an option. Usually programs like Lightroom, which try to combine the functionality of a photo archiving/management application with that of a RAW converter, are too slow for this task and therefore not a solution. 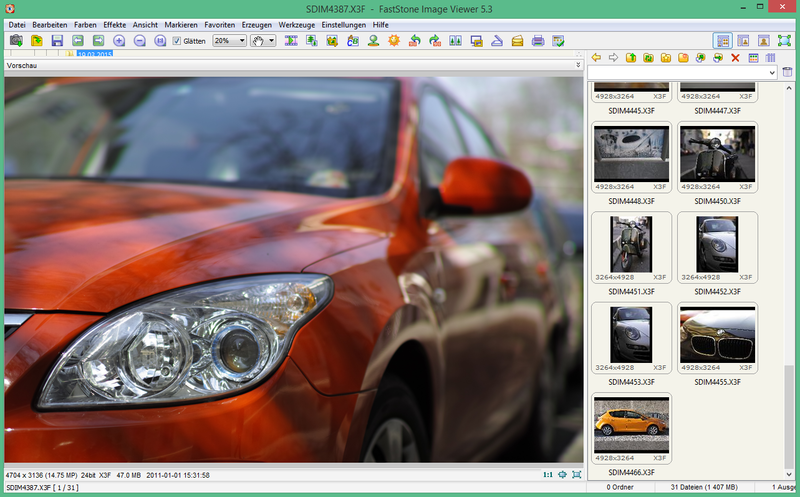 The application FastStone Image Viewer is an excellent solution. It isn’t complicated to use, it works incredibly fast even on slow hardware, plus it’s free of charge. More than that, it’s not particularly choosy and it can, for instance, even display embedded JPGs with exotic file formats such as X3F.